Easy to load and easy to use, the GE WPGT9360EWW Profile Harmony 4.0 IEC Cu. Ft. King-size Capacity High Efficiency Top Loading Washer combines the best features GE washers have to offer with an incredibly energy-efficient performance. Its Energy Star rating assures you that it meets government standards for energy efficiency and that you can save money from your utility bills. 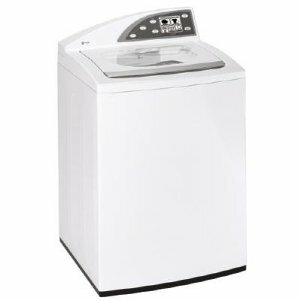 This top loading washer holds 4.0 cubic feet worth of laundry, equivalent to a load of king size bedding. The following washer cycles are available: Spin Only, 2nd rinse, Extended Spin, Power Rinse, PreSoak, PreSoak/Extended Spin, Quick Rinse, Second Rinse Extended Spin, Stain Inspector, and Speed Wash. Custom cycles are also available. Get the best cleaning performance with the HydroWash System with Infusor, which thoroughly cleans while caring for your garments. Whites, Colors, Dark Colors, and Handwash are just some of the settings you can choose from when selecting the right one for each load. The RighTemp system monitors the temperature settings. The HydroHeater internal heater increases temperature for more cleaning power. The direct-drive motor with adaptive spin speed combination prevents wear and tear on your garments without sacrificing cleaning and drying performance. The optional soil levels available are: Heavy, Light, Medium, Extra Light, and Extra Heavy. The AutoBalance Suspension System reduces shaking and vibration during operation. The Supreme Quiet package minimizes noise produced by the washing machine. The White on White finish gives you a clean, modern-looking washing machine. The HydroView tempered-glass lid is composed of durable material that allows you to see your clothes during the cycle, without requiring you to open the lid or halt the cycle. The high tech controls are composed of an LCD touchscreen with English and Spanish options. Programming your washing machine is simple and fast. The control panel also features Cycle Countdown with LCD indicators and a variable end of cycle signal, so that you always know where you are with your laundry. Fill and drain hoses are included. This washing machine has an excellent cleaning performance, making sure that your laundry will come out smelling fresh and free of dirt and stains. The GE Profile Harmony has all the options needed for every type of laundry, from dark-colored garments to delicate fabric types that may require handwash. Consumers save time and money, especially since it consumes less detergent. The capacity is great for most households. This washing machine is extremely easy to use and program. This washing machine can be noisy during operation. Customer service and repairs are difficult to deal with. Comments for GE Profile Harmony WPGT9360EWW HE Top Loading Washer (White on White) 4.0 Cu. Ft.
We bought this washer 7 yrs ago - after 3 years of quietly cleaning clothes well, it started to sound like gears were slipping then after 1 year it stopped spinning. Repairman said - out of warranty & it would be cheaper to buy a new one, so we shelled out another $1000 & replaced it. Now it has been 3 more years and the sound is back so I called GE (very helpful) they sent A&E Repair out free of charge but 2 days after they left the sound is back. I have to call GE back today - don't know what they will say - very frustrated! That's why I started googling to see what others think of this washer - for the high price it should last more than 4 years. This washer never properly spins our clothes. No matter what you do the washer never thinks the load is balanced. And my clothes are always tangled. Definately not worht what they charge you for it. We have had this washer for a little over a year. The Agitator(sp) went out, of course out of warranty. It has taken three weeks and we still can't get the parts. Maybe Monday?????? Never had a problem with it, have had it for 2 years. Cleans better than any other washer I have ever had, love the idiot proof washing cycles. Love the touch screen ....Highly recommended. We bought this General Electric Profile Harmony set locally and it is constantly being repaired. It is difficult to get fixed and takes at least a week to get it the parts. I don't recommend getting either of the two.